The scripture passage “The Lord has done great things for us and holy is His name” is meaningful to Sister Anna Phiri, OSF as she reflects on her journey…a journey of being open to God’s voice. Sister Anna was born on January 4, 1953 in Chipata, Zambia and is the oldest of 11 children in her family (three siblings are now deceased). Her father, Mathias, was a teacher and recognized the importance of education for his children. Her mother, Elizabeth, was responsible for raising the children and maintaining the household while often sharing stories about St. Francis of Assisi. But God was calling her. 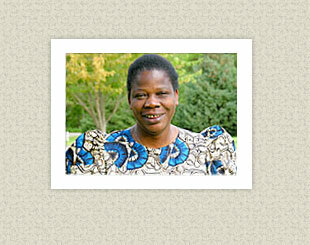 After much discernment, she entered religious life in 1971 with the Teresian Sisters in Zambia. She professed final vows in 1982 and worked as a teacher for her Community. She followed her father’s wishes in pursuing advanced education and received a diploma in religious studies from Regina Mundi, Rome, Italy and a master’s degree in religious sciences from Gregorian University, Rome. However, she desired more out of her life. Although she had served for ten years in her Community’s leadership in Malawi (where the Order was founded in 1929), she knew that she needed to open herself to God’s voice. “I listened to Him and decided to explore what it meant to be international,” she said. During her 1999 sabbatical, she attended the Institute for Spiritual Leadership in Chicago for training as a Spiritual Director. She was invited for Thanksgiving with the Franciscan Sisters in Springfield, IL. “From my first visit to the Motherhouse, it never occurred to me that I was the only African among these Sisters. There was such a spirit of internationality that I felt at home,” Sister Anna said. She transferred her membership to the Hospital Sisters of St. Francis on December 13, 2003 and continues to share her gift of ministering to young people about listening to God’s voice. “I accepted my work as the New Membership Invitation Minister because I believe that God continues to invite women to share our charism and to be Christ's healing presence for the life of the world,” Sister Anna said. “I’m confident that there are women whom God is extending an invitation to and that I can help them listen to His voice," she added. In addition to her work, Sister Anna shares her African culture through planting peanuts in the Motherhouse garden and playing the drum for celebrations. While she brings a different perspective to the Sisters who already are diverse with representation from Germany, Poland, India, America, and Japan, she knows that she is at home.